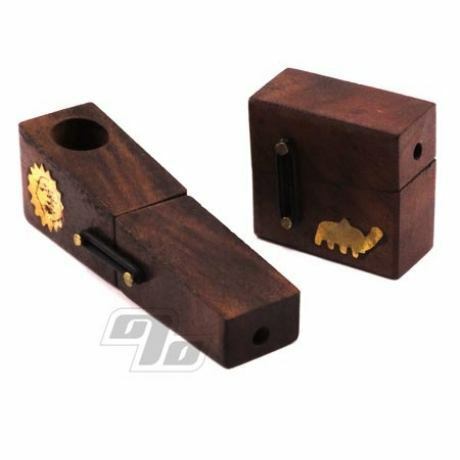 Cool little wood pocket pipe that folds out when you want to smoke a little tobacco. Decorative designs stamped in brass on the side (random). Connects using 2 Thin O-rings (extra included). Imported. The classic Flip Top Pipe is currently out of stock with no idea when we might get more. Until then, have you seen the American made Monkey Pipe? I've used for 15+ years and couldn't find a replacement til I found 1percent site. Rubber bands broke in a crucial moment. Good idea, just not sturdy enough. works great- have to replace o rings, but they send extra. It's very unique and subtle when closed. This item is exactly what I was expecting at a fair price with quick shipping, I replaced the o rings with dental rubber bands like the old ones came with and it works perfectly. Very satisfied! Great little pipe. Easy to hide, just pack the storage area,and go anywhere. Had an issue with the O-rings and customer service took care of it immediately. Service was great too.